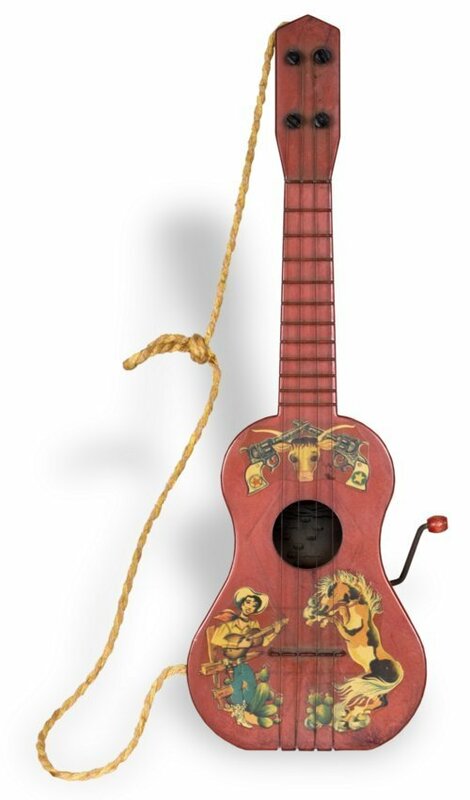 This plastic guitar plays music when the crank on the side is turned. This method of playing music in children's toys was developed by Elliot and Ruth Handler (the founders of Mattel) in 1949. It was called a "Cowboy Getar" and plays music arranged by Ted Duncan a Hollywood music arranger between 1943 and 1948. It is under the brand "A Futureland Toy" and was made in Culver City, California. The Western genre was most popular in the U.S. from post WWII (1945) to about the 1970's.